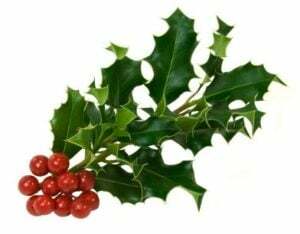 Holly Bush (Ilex) is the December birth month flower. What better flower to have for the month of December then than this? It is a very important plant for the month of December, and especially at Christmas time. Who doesn’t love to decorate their home with these leaves at Christmas? This is a shrub that grows outdoors all year round. Berries in colors of red, black, or yellow grow among sharp pointy leaves. One of the great things about the Ilex plant is that it is virtually maintenance free. Besides being easy to care for, they grow to become lovely full shrubs. The only caring they need is to be pruned back when they get too bushy. You will have to decide when your plant needs to be pruned. This shrub is a very different kind of shrub. It comes in both male and female versions. Holly bushes grow berries, and for a good set, you need to have both, male and female bushes. There are many different species of this plant. There are hundreds of different varieties for you to choose from depending on region and climate. Like I said, there are also male and female varieties, and both are needed to grow fruits. The leaves of the plant are dark green, waxy, and have sharp points on the edges. The leaves are thick and pointy to help deter bugs and animals from attacking the shrub. Flowers can grow from this bush, and usually will grow towards the end of spring and into the beginning of summer. If you want to grow a bush in your yard, you can plant them in a spot that is very sunny, or had some shade. They need to be planted in rich soil that is well drained. You can begin to grow this plant in the spring, summer, or early fall. If you choose to plant it in the summer, make sure you are watering it daily. They usually begin to grow during the second season after planting, and reach their full growth in about 5 or 6 years. Continue to enjoy your plant year after year. They can be a little reminder of Christmas time all throughout the year!